Getty/Rick T. WilkingWalmart will soon start using robots to pick and pack shoppers’ online grocery orders. Walmart will soon start using automated robotic carts to pick and pack shoppers’ online grocery orders. 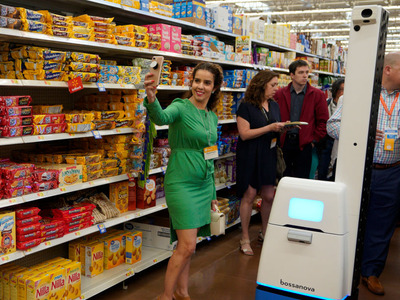 The new system is designed to give Walmart employees more time to focus on service and selling, while shifting the more “mundane, repeatable tasks” onto the robots. “The vast majority of grocery products we offer in-store will be fulfilled through this system, though our personal shoppers will still handpick produce and other fresh items,” Mark Ibbotson, Walmart US executive vice president of central operations, wrote in a blog post. Walmart’s new program follows Kroger’s announcement in May that it is partnering with Ocado, a UK-based online supermarket, that has robots with the ability to pack a 50-item grocery order in a matter of minutes.